A terrible shooting unfolded at multiple locations Wednesday evening in Bakersfield, California that left five dead after a man seemed to snap and go on a rampage. A total of six people were shot and killed including the gunman who eventually turned the gun on himself. 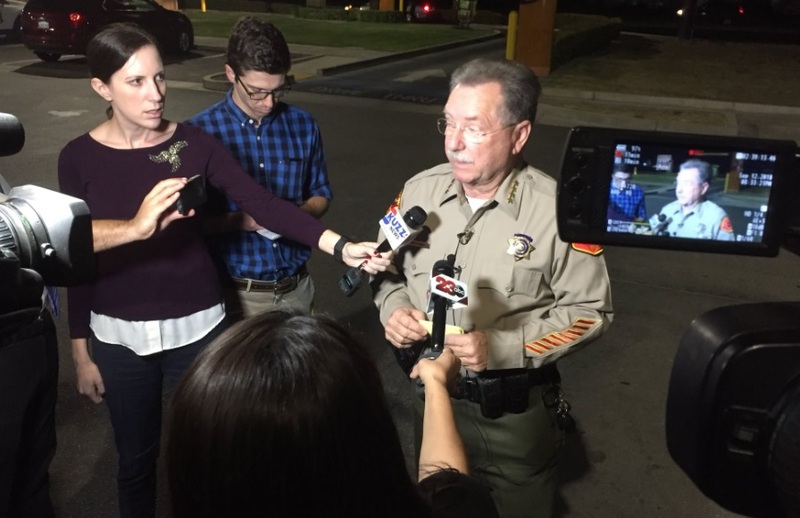 Kern County Sheriff Donny Youngblood described the incidents as a "mass shooting" during a press conference at 8:00 p.m. Tuesday. "This is highly unusual to have six people shot and dead in one incident," Youngblood said. Sheriff Youngblood told reporters that the gunman went to a trucking business with his wife and confronted a man who worked there. The business is located on Manwell Boulevard behind Bear Mountain Sports in Bakersfield. After confronting the man at the trucking company, the husband then shot him before turning and shooting his wife. Another male apparently heard the shots and showed up to the scene. He was then pursued and shot by the husband as well. The three killings would not be the end of the gunman's rampage. After killing the third victim who tried to flee, the husband headed to a residence near the corner of Breckenridge Road and Mesquite Land. When he arrived, he confronted another man and a woman at the home and shot them both. After killing his fourth and fifth victims, he carjacked a vehicle with a woman and a child still inside but the child managed to escape. When deputies finally caught up to the stolen vehicle, the husband was driving on Edison Highway. When he realized he had been caught, the gunman pulled over and shot himself in the chest. The gunman and all five of his victims died making it the third worst mass shooting since the Parkland, Florida school shooting, according to <a href="http://www.gunviolencearchive.org/reports/mass-shooting?sort=desc&order=%23%20Killed">Gun Violence Archive.</a> The second deadliest shooting is listed as the Santa Fe High School shooting that occurred earlier this year in May. Sheriff Youngblood was also quoted as saying, "This is the new normal." Sheriff Youngblood also confirmed that the officer who fronted the suspect, who has yet to be named, was wearing a body camera but have not yet been able to review the footage. The shootings were witnessed by around 30 people who are being interviewed by investigators. The sheriff also added that they are working to determine how the victims are connected if they are at all. I would certainly not like to call this "the new normal", but there does seem to undoubtedly be an increase in exceedingly violent domestic crime. Could this rise simply be due to the ever-increasing rise in population? Or is there some other sinister effect to blame such as the disintegration of traditional family values or a mental health epidemic? There was also a recent incidence of extreme domestic violence in Washington state where a 32-year-old man violently cut the head off his girlfriend in front of their 3-year-old daughter. When interrogated by the police, Timothy Paul Hernandez told them that "God told him to do it". This seems to show that it is possible for a person to snap whether it is rage or pure insanity and commit such a gruesome act as the one seen in Washington and now Illinois. It is not clear if Hernandez was committed out of rage, but a detective did say, "Timothy advised that he had spoken with God, who told him to strike down his girlfriend … because she did not repent. Timothy stated that he struck her down, and caused for her head to be removed from her body." Court documents also said that Hernandez quoted Bible verses from Revelations to detectives. "Each of the verses that were quoted had passages in them that spoke about women who did not follow God’s word, so God stuck them down," the documents said. Details of the shooting in Bakersfield are still unclear with law enforcement still unable to release the names and ages of the victims or the gunman. Local news in Bakersfield reported that people were seen sobbing in front of Bear Mountain Sports. Investigators were also seen interviewing neighbors near the residence on Breckenridge where the shooter killed a man and a woman. Summary, Gunmen catches wife with another guy, Kills him, her, others and himself. can't the writer leave out all the high school hyperbole? Adjectives uber alles. It's just a typical day in California, as the stresses of a jew dominated system drive another person over the edge. Revenge of the bean. Another Mexican returns to his roots. The idiot that got involved wins the Darwin award though. Even if he was hitting it too, white(or brown in this case) knights are a waste of space.